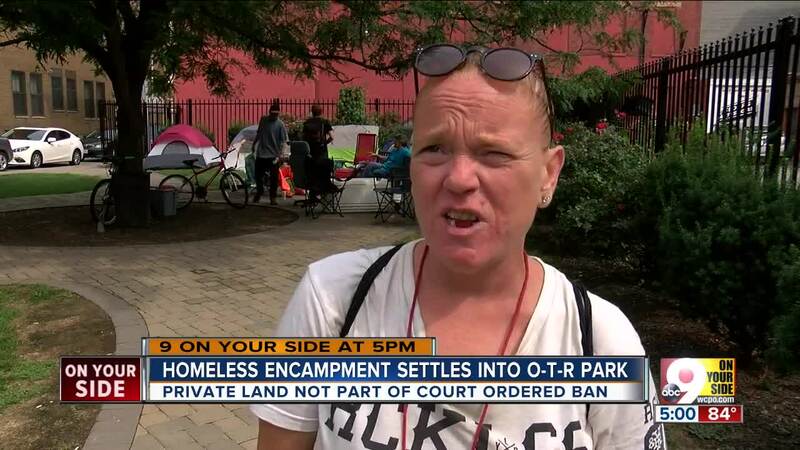 CINCINNATI -- The shrinking number of homeless people forced to move from one street encampment to another the past few weeks may have finally found a place to stay a while. 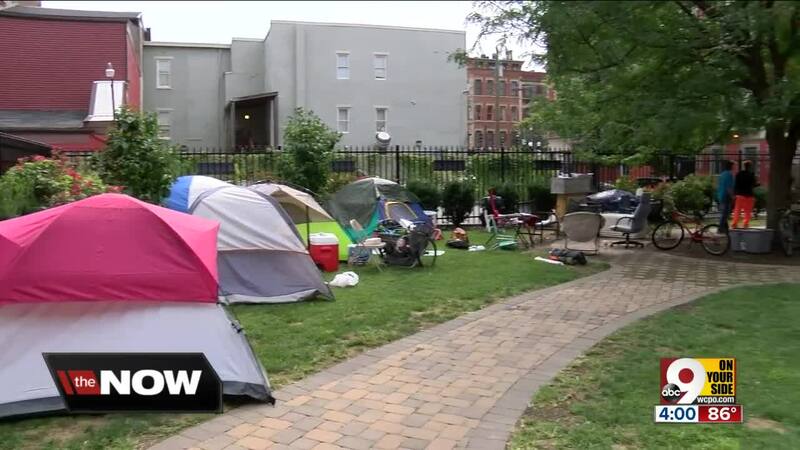 Their new camp, which is situated in a pocket park at 13th and Republic Streets, sprung up overnight Friday on private property shortly after a judge banned their tents on public property throughout Hamilton County. The property owner told WCPO the group didn't ask permission to camp there, but they won't be kicked out. In fact, the owner, Over-the-Rhine Community Housing, may be able to find permanent housing for them. "We've been doing this kind of work for about 40 years in this neighborhood, so this isn't the first group of campers who have been on our property and it won't be the last," said housing director Andy Hutzel. Hutzel's organization has 450 housing units in the neighborhood - some set aside for the homeless. "Our role is, 'Let's engage them and see what kind of housing solutions we can come up with,'" Hutzel said. New homeless camp at 13th and Republic Streets in Over-the-Rhine. By Friday morning, the new camp consisted of about a half-dozen tents, a few chairs and a table. Brian Garry, a homeless advocate, said "about 10 or 15" people were in the camp and their mood was "very calm, very happy." "People are feeling like we got a bit of a victory because at least they can’t put us out right now," said Garry, chair of the Human Services Coalition of the Faith Community Alliance. "We had rest last night for one of the first nights in a long time," said a homeless man who called himself Desmond. It was Desmond's fourth camp in two weeks. Desmond used to live in the tent camp along Third Street and had been proclaimed "Mayor" by campers there. He said they settled into the new site Friday night. Having to repeatedly move camp because of city and court orders has been difficult, Desmond said. "You lose properties, people scatter, now people who were getting services and help, by them moving us now, we have to go find them to continue with their help," he said. But Desmond also noted a positive result from their odyssey and the public attention that has followed. They have been able connect with more services and shed a public light on the problem of homelessness in Cincinnati, he said. "We have saved so many lives in the last couple of weeks because of the attention that we brought. We're building bridges. We're putting people together," Desmond said. "There's a lot of services out here that can help, but people are scattered. By doing this, services came up with other services and worked things out. "This is a beautiful thing what's happening," he said. To Desmond's point, Sharon Watts of Forest Park told WCPO she brought tents and tap lights for the new camp and said she is trying to get a portable toilet. "Serving the community is something I have a passion for, so to see this compound here made me stop and see if I could offer services," said Watts. Watts said her job is partnering with the city of Cincinnati to help find jobs for at-risk youth. "I had received some pop-up tents - six-person pop-up tents - at Traders World. I was gathering them in hopes that I could find people that were on the bridges to get them off the pavement," Watts said. Asked why she wanted to help, Watts replied: "It's called paying it forward." "I wasn't always able to do different things with my life until I was educated with the college and I was able to break free of poverty," she said. "Living in an impoverished world, we want to be able to pay it forward as we gather information on how to survive." The people in the newest tent city know that it isn't a permanent solution. Their number is much smaller than the 50 or so who lived along Third Street two weeks ago. Many others who had been living on the city streets recently have found shelter, even filling out applications for permanent housing, according to Kevin Finn of Strategies To End Homelessness. "A number of people have gone into shelters over the course of the last couple of weeks. There have also been some people that have gotten into housing programs or have gone into treatment programs of various sorts," Finn said. Finn and Hutzel said it won't be long before the lot at 13th and Republic will be completely clear of tents because the people there now will have taken one of those options. There was an offer to move the homeless to Roselawn and the new Summit Center Campground at New Prospect Baptist Church, but that offer was turned down. "Most of the services that homeless people need to access are closer to downtown.," Finn said. For now, advocates are helping camp residents fill out the paperwork that could lead to permanent housing. "We're trying to figure out exactly where they're at in their housing situation, what barriers they have and how we can help them," Hutzel said. One of the holdouts, who called herself Stacey, says those left in the camp are trying to move on. "What we're getting tired of is being like we're trash. We're not trash. We're all human beings just like you all," Stacey said. Finn defended the city's actions in forcing the camps off the streets, suggesting those who had been living there benefited in the long run. "It is very often necessary to take a carrot-and-stick approach to this sort of thing where applying some pressure for people to change their situation and get off the streets — while at the same time offering positive options," Finn said. "That’s how a lot of people come to be not homeless anymore." Garry insists that the way to end homelessness is to have more affordable housing. To Garry's thinking, the homelessness problem resulted from the recent high-end development that pushed people out of Over-the-Rhine and Downtown. "This is a symptom of the disease of gentrification," Garry said. "This is a result of 25 years of city policies that have favored developers instead of people who need to be raised up, who need help. "The permanent solution is that the city properly fund human services, that the city properly fund affordable housing," Garry said. "If the problem is homelessness, then the solution is housing." After what appeared to be a two-week cat-and-mouse game, Judge Robert Ruehlman banned the homeless camps from public places on Thursday - on one condition. Ruehlman said his order can't be enforced unless there is enough room in local shelters. The order does not apply to private property. 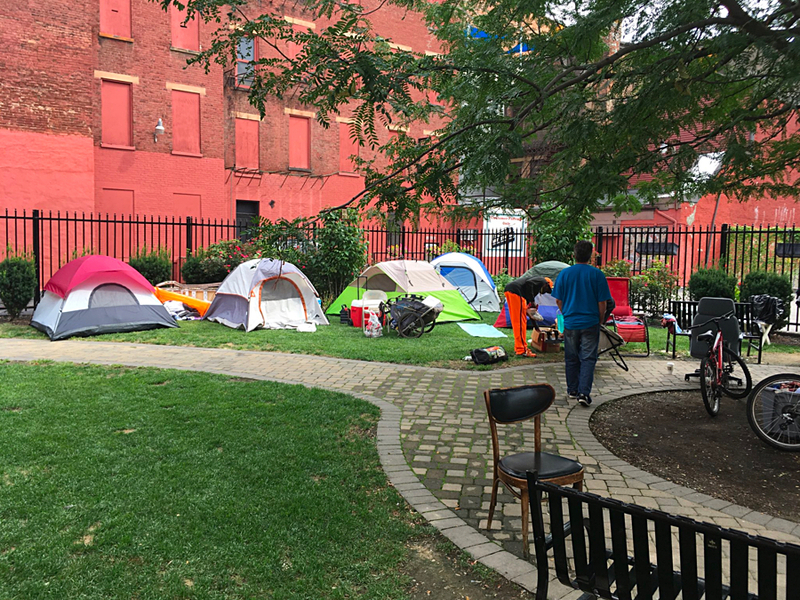 The city ordered homeless camps removed from Third Street in Downtown two weeks ago, but when they returned, Mayor John Cranley asked County Prosecutor Joe Deters for help. Deters got Ruehlman to grant a TRO banning the tent dwellers from the Central Business District, claiming that drug use and drug sales related to homeless camps "cause immediate and irreparable harm to the surrounding community." Some people who lived in the camps then moved to Reading Road near JACK Casino. Deters then got another TRO banning them from the area between I-75 and I-71 north to the Norwood Lateral. After leaving the casino area on Thursday, some people went to shelters, but about two dozen went one block east of I-71 and pitched tents on Gilbert Avenue, across the street from WCPO. Police peacefully cleared that camp Friday night.